Chinese people tend to be open and friendly year round, but they are even more so during the Chinese Lunar New Year holidays, a time when everyone except for the most essential staff enjoy a week’s paid holiday. It’s an especially relevant celebration for families, with members from all over making an effort to return home to celebrate together. And so it provides the perfect chance to be introduced to a local family who will host you during the full week of festivities. You’ll learn about their traditions, culture and rituals around the festival, which is celebrated for sixteen days from New Year’s Eve to the Lantern Festival. There are a number of rituals preceding the main week of revelry, many of which you’ll witness and perhaps be involved with. Including, thoroughly cleaning the home to remove the accumulated bad luck from the previous year and clear space for the good fortune of the upcoming new lunar year. Once the home is ready for the fresh start, it’s decorated with red and gold – colours of good luck and prosperity in Chinese culture. Specific plants, fish, such as goldfish, and fruits are bought and displayed as decoration. You’ll learn what each item means and its rightful place in the house, as well as how to cook some of the most common Chinese New Year foods, such as dumplings, fish, spring rolls, and NianGao - Chinese New Year’s cake; each symbolising a different attribute. You’ll also witness seniors giving a “hong bao “,or red envelopes containing money, to pass on best wishes to their juniors; bosses to staff, parents to children, married couples to single friends. Should you wish to try it yourself, there a couple of rules: never give any amount that includes a 4 - in Chinese, 4 sounds like “death” - odd numbers are considered bad luck and try to avoid giving multiple notes – one is just fine. Out on the street, every road, building, and house in areas celebrating Chinese New Year is decorated with red, the main colour for the festival. Red lanterns hang in streets; red couplets are pasted on doors; banks and official buildings are decorated with red New Year pictures depicting images of prosperity. Many cultural activities are arranged during the festival; as you can imagine, rural areas and small towns retain more traditional celebrations than the cities, such as setting off firecrackers, ancestor worship, and dragon dances. You’ll visit some of the neighbours’ homes where you’ll exchange Mandarin oranges. The Chinese words for orange sounds like “luck” and “wealth”, and it is considered impolite to arrive at someone’s home empty handed during Chinese New Year. Upon arrival, present them with a pair of oranges (or pears), that will be exchanged as a gesture of goodwill during the festive period. Throughout the festivity, fireworks and firecrackers will come alive at almost every corner. The tradition is to set off a string of small firecrackers, followed by bigger ones, which symbolize “sounding out” the old year and “sounding in” the new one. The louder the firecrackers, the better and luckier it’s believed the coming year will be. 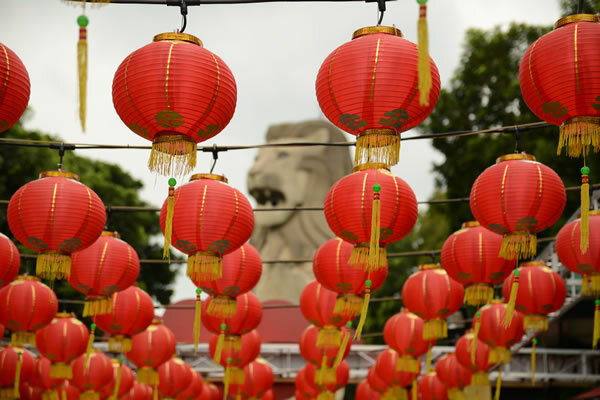 Continue your New Year celebrations in one, or perhaps two, of the many countries that enjoy Chinese New Year festivities. Drop us a note and our Asia Trip Planner will help create your very own experience.